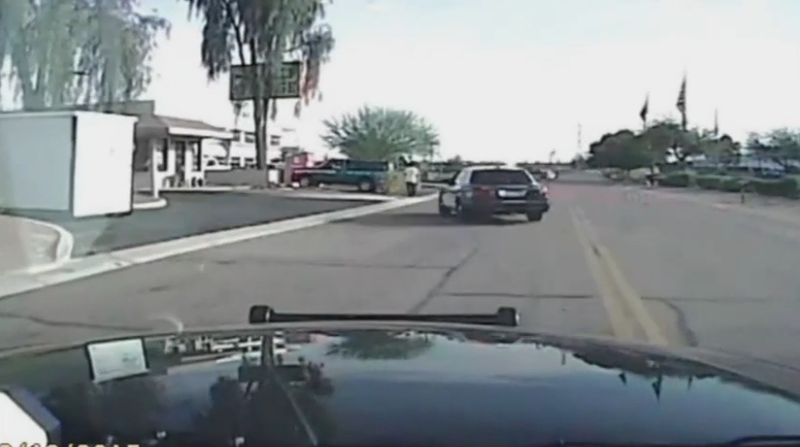 Arizona dashcam video: Police car slams into armed suspect in multiple crimes. A Marana, Arizona, police cruiser moments from striking suspect Mario Valencia. The suspect, 36-year-old Mario Valencia, was hospitalized and released into custody. Before the moment captured on video, he had allegedly robbed a 7-Eleven while holding a “metal object,” set a fire at a church, broken into a home, stolen a car, and stolen ammunition and a rifle from Walmart. He was carrying the rifle when he was struck and had reportedly fired it in the air and pointed it at police and at himself.